After Harry Potter came The Casual Vacancy. It was a powerful follow up to what has now become a classic (so quickly!) series in literature that has touched millions of lives. The Casual Vacancy was just as engrossing, just as compelling and set a different tone for J. K. Rowling. The Casual Vacancy was a big book about a small town. It had the tone of Stephen King’s Under the Dome mixed with Coronation Street with It was a real departure for her and I came away from it thinking of Dickens with a modern twist. It showed that J. K. Rowling had more than one kind of magic up her sleeve. Along with bazillions of others, I waited to see what would be next. You see, it’s a bit of a mystery. Imagine my surprise when news started popping up that J. K. Rowling had written a book under the false name of Robert Galbraith. I didn’t believe it at first, not really. Being a Harry Potter fanboy, I was used to news of constant fake novels. To anyone who hasn’t fallen in love with the books or the movies probably won’t get it. I remember going to a midnight release for the fifth book Harry Potter and the Order of the Phoenix. It the whole evening struck me as magical. I had just gotten off a midnight shift and headed straight to the bookstore. It was filled with tons of people, most dressed in costume, all waiting for that moment when we could start reading. It struck me that night that there was something magical about millions of people around the world, all reading the same book at the same time (thousands of millions if you take into account the different time changes). That’s not just a book-it’s an experience, that is magic. It also ends up being the worlds biggest book club that topped Oprah’s. Now that’s awesome. You can be pretty much assured that I’ll read every book that J. K. Rowling has written or will write; but is that because she wrote the Harry Potter books? No, as much as I love them. It has to do with the fact that she’s one hell of a storyteller. She tells amazing stories, pure and simple. The news of The Cuckoos Calling continued to pour in, finally confirmed later in the day by the CBC, the New York Times and the Huffington Post. To say I was stunned was an understatement. Everyone knows by now, that J. K Rowling wrote the book under a pseudonym. I couldn’t wait to read it. I got the eBook as soon as I got home and am patiently waiting for the hardcover. A friend of mine asked me if I would have read it if I didn’t know it was by J. K. Rowling. The answer is probably not, but not for the reasons you might think. I love mystery novels. I grew up on them: Agatha Christie, Ruth Rendell Jonathan and Faye Kellerman, Mo Hayder, P. D. James, Robert B. Parker, Raymond Chandler, Sue Grafton. I read all of their books and tons more authors than I can remember. Though I haven’t read a mystery novels, their what I cut my reading teeth on; well that and Stephen King. I will occasionally pick up a mystery novel from time to time if its advertised well. The Flavia De Luce mysteries by Alan Bradley and The Hangman;s Daughter by Oliver Potch are my current fave mystery books, that and anything by Minette Walters. The thing is though, big releases like theirs are seen and, in J. K. Rowling case, she didn’t want to be. She just wanted to write and see what would happen. I think that’s pretty darn cool, actually. She could have gone her normal route but lets face it, if The Cuckoos Calling came out as J. K. Rowling’s next release, it would have sold billions. People love her books that much. I really admire Rowling for creating a bit of mystery around The Cuckoos Calling. I think it’s a shame that her pseudonym was revealed in such a way. I don’t know how I’d feel if something I had worked under to give me freedom turned around and brought me more scrutiny. But hey, if it hadn’t been, I wouldn’t be able to read the new J. K. Rowling book. However, the question should really be: Is The Cuckoos Calling any good? Oh my god yes! I haven’t had this much fun reading a mystery novel in years. Cormoran Strike is a private detective with no home, no cases and creditors on his heels. He’s also fresh out of his recent relationship, for the umpteenth time. Charlotte and him are splits for sure this time. Seeing as it was her apartment, he’s currently sleeping in his office on a camp bed. Enter Robin, the temporary. She’s recently engaged to Mat and isn’t sure what this new assignment will be. When she finds out that Cormoran Strike is a private eye, heart skips a bear. It’s always been her secret ambition to be a private eye. It’s always seemed so thrilling, so mysterious. A mystery is just what ends up waling through the door: John Bristow is Lula Landry’s sister. Three months ago, the famous model commited suicide. Bristow wants Corbraith to prove she didn’t kill herself. Are Strike and Robin up for the job? 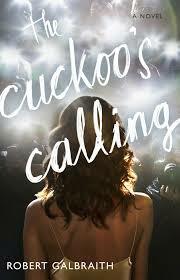 I’m half way through The Cuckoos Calling and thus far it’s been filled with models, sleezy lawyers and liars, oh my! Add in the uppity socialites, security guards and wanna-be actors and limo drivers, a bag lady and more. No one is telling the truth (or are they?) and eveyone has something to hide. The Cuckoos Calling is incredible and I’m only half way done. I can’t wait to see what happens next. So why am I writing about it before I’m done the book? Personally, I think anyone that enjoygs a good mystery has to read this book, pure and simple. Anyone that enjoys a well told novel, really. It doesn’t matter who wrote it, whether under the name of Rowling or Robert Galbraith. Its a story well told. All the hoopla about her false name being revealed is old news. Just read the book and form your own opinions. I still feel badly for J. K. Rowling and don’t believe that this was all done as some sort of publicity stunt, as some people are claiming, but I am really happy that I get to read the book. The Cuckoos Calling is a brilliant detective novel told in the classic vein in a modern setting. and I for one feel very luck to be able to read it.